Though it references Sam Spade and Phillip Marlowe, A Walk Among the Tombstones lacks their panache. It never presents a well-muscled structure or brain-tickling complexity. Either of those things would have made this gritty, bloody thriller much more engaging and entertaining than it is. That being said, Liam Neeson does a strong, world-weary turn here as an independent detective and badass. Dan Stevens is captivating in a role as far from Downton Abbey as this handsome man could get. Overall, this is a meandering little trifle, grittier than Neeson’s Taken films. Tombstones is also gory and sexist – the woman is always in distress; otherwise, these damsels are hardly characters at all, much more like meat. It’s 1999, NYC, the middle of the Y2K panic. Years after leaving the police force, recovering alcoholic Neeson works on the down-low. He does favors for clients, and they give him “gifts” of money under the table. Stevens is a rich drug trafficker whose beautiful wife is kidnapped. After he pays a hefty ransom, he is gifted a bloody discovery. Bent on revenge, Stevens hires Neeson to find the sickos. 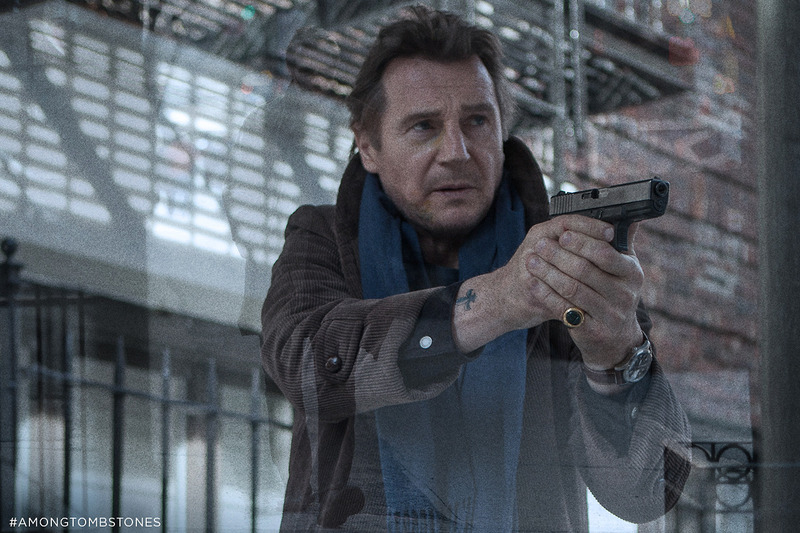 Neeson must dive into a world of fellow addicts, along with psychopaths and weirdoes, to solve the mystery. Along the way, he meets a homeless black kid (Astro, a one-time contestant on The X Factor) who tries to help. 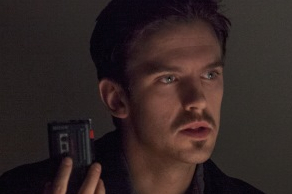 Dan Stevens runs as far away from his Downton Abbey role as he could possibly get. All of the actors – even Astro – do a commendable job with what is basically detective story pap. Director/screenwriter Scott Frank loves gumshoes and complicated crime thrillers. He wrote the brilliant Dead Again in 1991. He also adapted Get Shorty (1995), Out of Sight (1998), and Minority Report (2002). This film is based on a Matthew Scudder novel, one of eighteen that Lawrence Block has penned. Though the Y2K panic is mentioned several times, it doesn’t seem relevant to the plot. What’s also lacking in the movie – something that may also be missing in Block’s book (I haven’t read any of his works) – is style and complication. A Walk Among the Tombstones has a flimsy structure provided by Scudder’s (Neeson’s) visits to Alcoholics Anonymous meetings. What it cries for is a brain-twisting plot like Seven or more psychological intrigue like The Silence of the Lambs. Instead, we’ve got typical stuff, like the kidnappers whispering into phones, making grisly threats. We’ve got Neeson threatening back. We’ve got a cute, homeless sidekick tagging along to show that this hardened detective secretly has a heart of gold. Some of the lines do sound like Spade or Marlowe: “”Let her go or you’ll to be looking behind you for the rest of your worthless life.” Neeson has the gravelly voice and demeanor to carry off the sort of noir that would’ve made this flick more fun. Frank, however, decided to write and direct A Walk Among the Tombstones into a bloody, violent but pale imitation of an entertaining and more stylish crime thriller.